Her ordering can be used for recognition of XIPs but even more so for describing three different styles for, or circumstances of applying Xi. 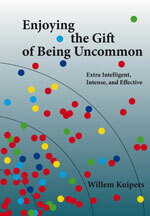 The fascinating issue is whether the XIP is somehow aware of being uncommon and of the personal process of expression. If that is not the case, whether would more awareness make a difference and induce choosing another category to increase personal effectiveness? People expect all gifted individuals to be superstars. The XIPs who can be recognised as superstars are “taller, healthier, handsomer, wealthier, happier, and nicer than most people.” They work hard but also play hard: They do a lot of things outside their work: They involve themselves in social activities, sports, culture, etc. They excel in whatever field they operate in. Their values are typically in line with the values of their environment and their lust for life is just as above average as their performance. The subject of Xi often holds little interest for superstars because they feel no need to have an explanation for being one. As far as they are concerned, they have always achieved things with little effort on their part. XIPs who can be recognised as strivers work incredibly hard – at school, at work, in everything they do. They produce almost superhuman performances, all based on their inner motivation. They appreciate structure and clear leadership. They typically do not come up with innovative scientific or cultural results but what they do, they do in an extraordinarily meticulous way and the most appropriate manner. The adults often consider themselves to be married to their work. For them, too, Xi is typically not a topic that interests them: They explain their above-average performances as being a result of their above-average desire to work and abundance of energy. They are too concerned with work to be distracted by side issues like wondering about their uncommonness. If something grabs the interest of independents, they will work hard at it in a creative and often brilliant manner. They possess a deep-rooted personal value system. They pay no attention to anything that does not interest them, irrespective of the consequences. Because they are the square pegs in the round holes of society, their career path can run rather unpredictably. If there are issues of authority at play, independents can be enormously uncooperative, and conflicts can run high. They typically attach no value to being popular. More often, independents are innovators rather than followers. They are the ones most likely to produce the invention that constitutes a breakthrough. If you are able to understand them, they are never boring and always inspirational. If you cannot understand them, they’ll drive you crazy. The social breakthrough of these creative XIPs can take a long time to manifest, if at all. This can result in them abandoning all social links or lead to criminal behaviour and even death. Independents have much to gain by exploring the topic of Xi, certainly if they have negative experiences with “being different from their environment:” Even though they are the most talented of the three groups, they are often the least understood by their environment. The acknowledgement of Xi can be the catalyst that leads to “hearing the sound of pennies dropping,” so that they are better able to let their talents loose on the world.